If one were looking for a perfectly realized film, Au Hasard Balthazar would be as likely a candidate as any. For every convention of film grammar and narrative that this 50-year-old masterpiece utilizes, it uses strictly on its own terms, discarding many more. 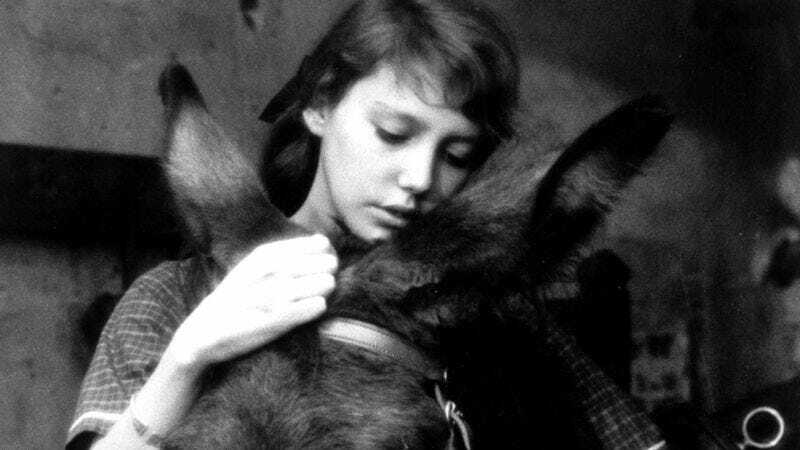 The work of the French director Robert Bresson, it follows a simple donkey named Balthazar from birth to death, passing from owner to owner, subject to both violence and the purest affection. Perhaps this sounds facile, though that is true of all of Bresson’s great movies, which found graceful means to portray a cruel and compromised world. He favored bare necessities (discussed in his book Notes On The Cinematograph, which has just been reprinted) in a personal mode of filmmaking that drew a relationship between mystery of meaning and clarity of form. For Bresson, one of the defining iconoclasts of film, the essence of cinema lay in its most rudimentary tools, and the simplest things could be invested with the most power. This could be a shot of a hand or a single sound effect or an object falling to the ground. Starting with his third feature, Diary Of A Country Priest, Bresson began discarding those aspects of film style that he considered theatrical or redundant, but he never considered eliminating narrative. Out of his wholly original scripts, Au Hasard Balthazar is the richest with incidents and figures: the naïve and loving Marie (Anne Wiazemsky), the abusive hooligan Gerard (Francois Lafarge), the saintly town drunk Arnold (Jean-Claude Guilbert). But it depends exclusively on Bresson’s singular and controlled style. Bresson didn’t like professional actors (though Wiazemsky ended up becoming one) or most conventions of performance, and he shot with a single lens, keeping camera movement to a minimum. But in its effects, his ascetic style is sensual, delicate, gripping, transcendent. This is why generations of filmmakers and critics have revered Bresson: More so than any other director after the silent era, he demonstrated the potential of the fundamentals of film. 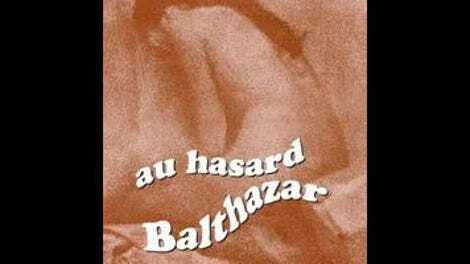 Au Hasard Balthazar is often called a difficult film; it is in the sense that Bresson resisted the way movie audiences were conditioned to watch movies. In Balthazar, his “models”—as he preferred to call his often blank-faced non-professional performers—don’t portray characters, but lives, stripped of the momentary and reactive, revealing consistent arcs of tragedy, abuse, unhappiness, and desire in a look or a hand reaching for another hand in the dark. Perhaps most importantly, Bresson never attempts to humanize Balthazar. Blessed with “the salt of wisdom” in a mock baptism at the beginning of the film, he never behaves with anything but an animal’s ignorance, and his bray—never uttered in reaction—has to be the most ear-splitting sound in all of Bresson’s carefully edited soundtracks. What Balthazar experiences of human nature is both pure and limited: the embrace of a lonely young woman, the unprovoked attack of an angry young man, and the work of the farms whose owners worry over money. He is only a donkey, and therefore something much more.